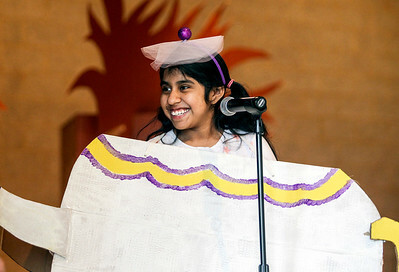 Sarah Nader- snader@shawmedia.com Mrs. Potts played by Nancy Amendsendi-Silvestri sings "Beauty and the Beast" during a production of Beauty and the Beast by students in the Autism and Life Skills classes at Creekside Middle School in Woodstock, May 15, 2014. The student actors have been practicing since February and were assisted by students who participate in the Best Buddies program. Sarah Nader- snader@shawmedia.com Dressed as a wolf, Alan Salazar (left) and his Best Buddy, Fiona Child, walk backstage after Salazar acted in a production of Beauty and the Beast by students in the Autism and Life Skills classes at Creekside Middle School in Woodstock, May 15, 2014. The student actors have been practicing since February and were assisted by students who participate in the Best Buddies program. 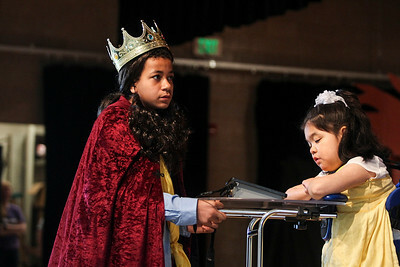 Sarah Nader- snader@shawmedia.com The prince played by Isiah Bryant (left) dances with Belle played by Estefany Cortez during a production of Beauty and the Beast by students in the Autism and Life Skills classes at Creekside Middle School in Woodstock, May 15, 2014. The student actors have been practicing since February and were assisted by students who participate in the Best Buddies program. Dressed as a wolf, Alan Salazar (left) and his Best Buddy, Fiona Child, walk backstage after Salazar acted in a production of Beauty and the Beast by students in the Autism and Life Skills classes at Creekside Middle School in Woodstock, May 15, 2014. The student actors have been practicing since February and were assisted by students who participate in the Best Buddies program.